This image of President Kennedy was taken on 12 September 1962 during a speech at Rice University in Houston, Texas. 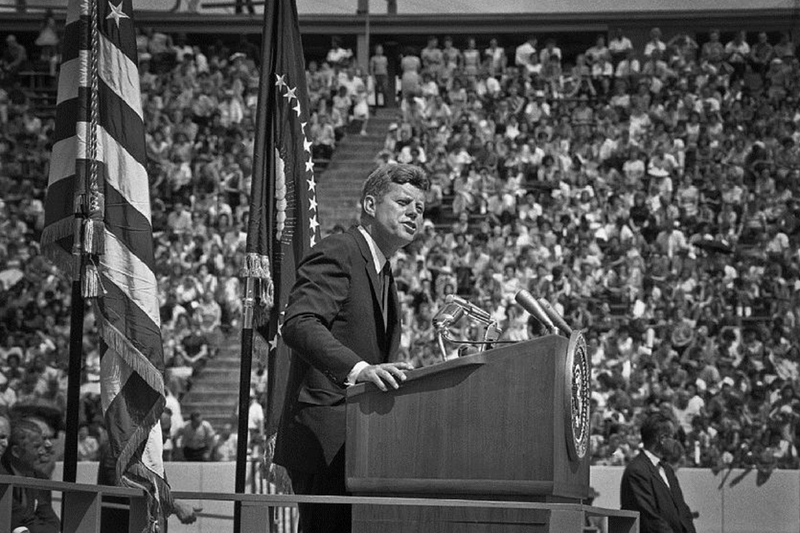 The address was originally titled "Address at Rice University on the Nation's Space Effort" - but it soon became known as the "We Choose to go to the Moon" speech (because of a particularly strong line and the corresponding change of Kennedy's tone, rhythm and volume). From a body language perspective, one thing John Kennedy did was to rest his hands on the SIDES of the podium (lectern). It's an important distinction that they were not placed on the back edge (closest to him). He was the first President to do this for which there is a prominent photographic record. He so not because he was counseled to by an expert, rather because it took pressure off of his back - for he had suffered a serious injury in World War II as well as degenerative spinal disease secondary to medications he took before the war. Historically and from a body language point-of-view, this habit of resting his hands on the sides of the lectern also benefited the President significantly. It's one of many examples of what are known as "Alpha-Beta Hybrids". As the name implies, these are nonverbal behaviors which are not too alpha and not too beta - but somewhere in the middle. The further the hands are placed forward on the lectern, the more alpha this signal becomes. Most people who use alpha body language signals tend to over-use these. And very often those individuals displaying beta signals will also "overdo it" and be too demure. Thus it makes perfect sense to be able to know exactly how and when to adjust one's nonverbal behavior for what is needed in the specific situation at hand. Of course, even alpha-beta hybrids can be over-used. Body Language should NEVER be used with a "one-size-fits-all" approach. Like Jazz or improv - a person should always be observing and morphing to the moment. Women politicians (and other "leaders") should use this specific nonverbal behavior much more often. Many women (mistakenly) may hesitate to do so for fear they it makes them look too masculine. It is however a difficult body configuration to make for many women to make because of their relatively shorter stature. Although it is cost prohibitive for many, other "leaders" who are less tall would be well-advised to bring a custom lectern with them. Bill Clinton and Donald Trump are two prominent examples of other politicians who routinely use the "Kennedy Lectern Lean". Nonverbal Communication Analysis No. 3441: Michigan Governor Rick Snyder Interview regarding Flint's Water Crisis - Is He Being Honest and Sincere?